Andre Norman went from juvie, to jail to Harvard. 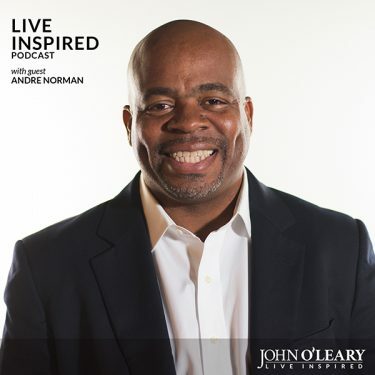 Vulnerable insights like this one from Andre will allow you to expand your humanity and understand the very real, everyday struggles that can snowball into time spent in jail. Join me for an amazing conversation that will shed light on an often forgotten part of our community… and share the redemption that can come with setting a lofty goal and sticking to it. From jail to Harvard, our friend Andre is here. Don’t miss it. If you want to get to a new place at the next level, it’s about forgiveness. Empathy v. forgiveness – choose empathy. Once you do, forgiveness will come. I’m the sum total of all of my mentors. Don’t speak to their potential; speak to their pain. I try to teach kids to ask for help. I realize I wanted my parents to be the ones, so I passed up good help. Take the help that is offered from teachers, etc. If you enjoyed this episode, check out episode 92 that shares the story of James Williams, an ex-fellon who now works as an organic farmer and crew chief at the social enterprise Ironbound Cider. 1. What is the best book you've ever read? As a Man Thinketh, by James Allen. I am in control of my thoughts, there fore I am in control of myself. 2. What is a characteristic or trait that you possessed as a child that you wish you still exhibited today? I laughed way more. I loved traveling and had a sense of adventure. I rode the bus after school. I rode everything I could for a dime. 3. Your house is on fire, all living things and people are out. You have the opportunity to run in and grab one item. What would it be? Hebrew Psalms book from my Rabbi’s wife. 4. You are sitting on a bench overlooking a gorgeous beach. You have the opportunity to have a long conversation with anyone living or dead. Who would it be? My grandfather, I never got to meet him. I’d ask if he’s happy watching the work I’ve down in his hometown, Petersburg, VA.
6. What advice would you give your 20-year-old self? Go to school sooner. Get counseling. You can do great things. It’s not where you start, or who you are around. Be your own best friend. Stop selling yourself short. 7. It's been said that all great people can have their lives summed up in one sentence. How do you want yours to read? He helped all people. The post Live Inspired Podcast: S9 | Ep. 95 Andre Norman appeared first on John O'Leary.